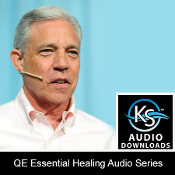 The QE Essential Healing Audio Series is a breakthrough collection of indispensable healing techniques. Each technique is hand-picked and personally taught by Dr. Kinslow. In his engaging, easy to understand style, Dr. Kinslow guides you step-by-step into the essence of pure healing. When you gain this knowledge you will be able to heal the flesh or soothe the mind, enrich your love life or dive deep into the stillness of your soul. The wisdom captured within this audio series has proven not only to be life altering, but life-saving. Treat yourself and those that need you to the gift of healing.